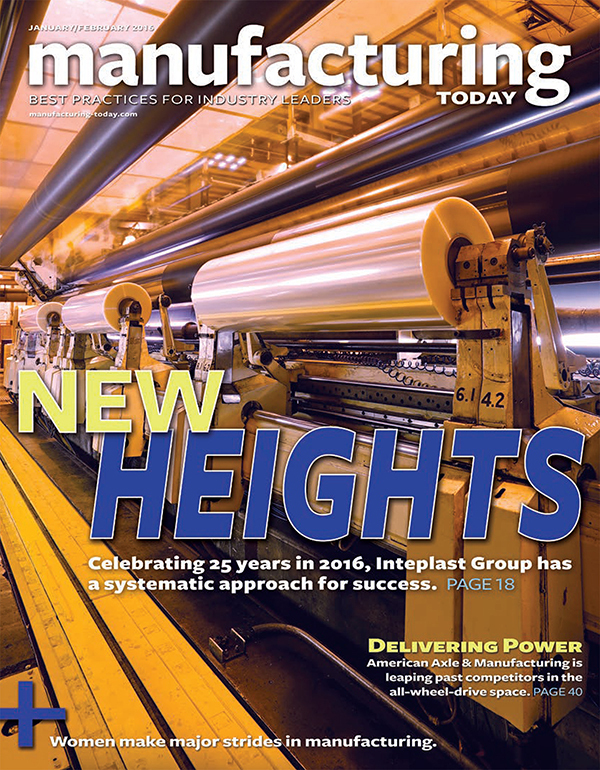 ACCOR Technology was featured in the January/February 2016 edition of Manufacturing Today magazine. 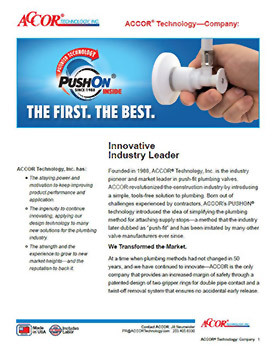 We’re excited that the publication recognized us as a pioneer in the push-fit supply valve market. Company founder and President Jerry O’Neill explained ACCOR’s early beginnings — starting out from scratch and raising capital from early investors. Jerry was driven by his vision that supply valves could be installed without tools, and years of research of development eventually paid off with our PUSHON patented technology. It wasn’t easy, considering ACCOR Technology was charting new territory. Especially since the plumbing industry wasn’t known to embrace change — or move fast, for that matter. “I guess you could say we were disruptive in the market because we were introducing something that wasn’t the old soldering and gluing,” Jerry explained to the article’s author, Stephanie Crets. “It was completely different in that all you had to do was push the valve onto the pipe. Of course, today push-fit supply valves have been widely embraced by the market. ACCOR’s FlowTite® products have been installed in a third of all new homes built in the United States. "The ACCOR valve is simply pushed onto the pipe stub-out and then hand-tightened to the fixture or appliance. The one-piece system, an industry first, eliminates joint leaks with its factory-attached connector. ACCOR’s patents assure a higher margin of safety than any competitor, especially on PEX pipe, due to its patented dual gripper ring design. ACCOR says its written 10-year residential warranty, including labor, is the strongest in the industry. This reduces liability for both builders and plumbers related to potential leak problems. “Quality control is paramount for our company,” O’Neill adds. “Our internal processes and customer service are aligned with our quality commitment." 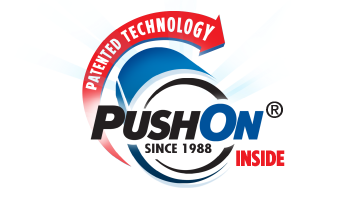 And several other companies have since followed suit to develop other push-fit products. We believe, of course, that imitation is the most sincere form of flattery — and we’re proud to have been the first to break ground in what would prove to bring major change to the plumbing industry. Most importantly, our products are manufactured in the United States, which is becoming more and more rare these days as companies are shipping their manufacturing needs to countries like China. 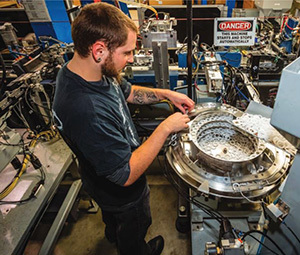 "We compete directly with brass valves that are made in China with much lower labor costs,” O’Neill explains. “The only way to preserve our business in the U.S. is to invest in automation machines that would decrease our variable labor substantially. That not only gave us the capacity to make a lot more valves, but it also decreased our variable cost per part while preserving our high quality. "“Most people think that automation means reduced employment; however, with ACCOR the increase in productivity simply means we are able to compete with foreign imports, which means we will grow our business and our workforce,” O’Neill says. 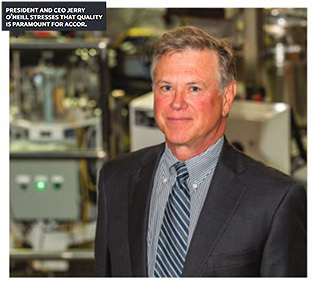 Jerry was proud to give Manufacturing Today magazine a glimpse behind the scenes and share a little bit about our manufacturing process at our state-of-the-art manufacturing plant in Wenatchee, Washington. We were also excited to announce that an expansion of the plant by 40% will start this year. More on that later! Media Inquiries contact us here.